Condition, condition, condition. There is no factor more important than condition when it comes to building a valuable trading card collection. This is especially true for high-value vintage cards, rookie cards and autographs. To assemble a truly investment-worthy collection, protecting your cards is more important than ever. Collectors have lots of options when it comes to trading card supplies. Times have changed since the early days of sports card collecting when young collectors were more apt to stick their cards into the spokes of their bikes than into any sort of toploader or protective sleeve. Other than a shoebox, trading card supplies didn't matter back then. Many modern collectors cringe at the thought of such mistreatment -- especially for vintage cards. Trading card protection has never seen such high demand, and has become a big business in and of itself. As more and more collectors treat their collections like potential investments, manufacturers have responded with a range of trading card supplies. Products have been developed for every niche of collecting. As a result, safeguarding your trading card and memorabilia collection has never been easier. Several companies make and distribute trading card supplies, but not all products are created equal. Anything made of plastic is a petroleum-based product. 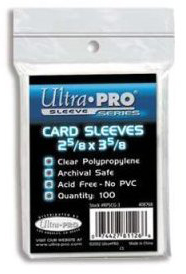 The top makers of trading card supplies, like Ultra Pro and BCW, make sure that there aren’t any harmful residual ingredients in their products that could hurt condition-sensitive cardboard. Oil and water don't mix. Oil and paper don't either. Collectors should only use protective products that are guaranteed to be acid-free. When it comes to basic storage, many collectors find themselves using a combination of methods and trading card supplies to protect their collection. The most common example is to use a penny sleeve and a toploader. Large quantities of cards can then be stored in specially designed storage boxes. Because trading cards are produced in different dimensions, not only in size, but also in thickness, it’s important to pair your cards with the right type of protection. Below is a detailed list of many of the archival-quality storage products available to safeguard your trading card collection. We've also included some products that will not only protect your cards, but to proudly display them as well. 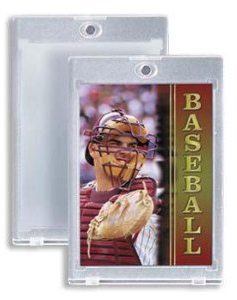 These individual plastic card sleeves (often called penny sleeves) are an effective and inexpensive way to store sports cards. They are typically available in packs of 100 and cost roughly one cent per sleeve. They are ideal for most cards up to 60 pt thickness and can be used alone or with a toploader. They are a great way to store and entire set, which can then be stored in a box and protected from edge and corner wear. Penny sleeves come in different sizes to fit every card from tobacco-sized cards to over-sized 'super' and 'tall boys' from the early 70s. As far as trading card supplies go, penny sleeves are essential. Much like card sleeves, toploaders are another must-have when it comes to trading card supplies. These individual plastic card holders come in several varieties including rigid and semi-rigid. They are available in several thicknesses to accommodate memorabilia, patch, and bat barrel cards. 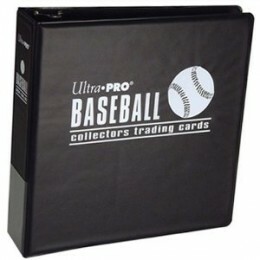 In addition to protecting and storing sports cards, they are also an inexpensive way to display your collection. A brand name variation of the toploader, the Cardsaver series combines the protection of a penny sleeve and toploader in one without the increased risk of incurring corner damage. Preferred by many veteran dealers and vintage card collectors for their quick and easy access and affordability, this type of storage system was one of the first types of trading card supplies to hit the market. They typically do not work well with today's thicker cards, however. These cases have die-cut corners to protect cards and are held together with a magnet. Also available with a UV coating for added protection against autograph fading, these are differentiated from regular holders with a gold magnet instead of a silver one. These two-piece cases offer a much harder and well-fortified exterior shell to house your cards. However, screwdown holders have been known to cause substantial damage to trading cards that are stored in them for long periods of time, particularly when they are screwed together too tightly. As far as trading card supplies go, magnetic holders are quickly replacing screwdown holders in popularity. With the development of memorabilia and relic cards, there became increased demand for trading card supplies that preserves and displays them. Enter the snap-tight. Available in different thicknesses to securely hold everything from 30 pt to 300 pt cards, these holders, as the name implies, snap together and are the exact dimension of the card. When paired with a card stand they make for a very attractive display presentation. It is important to note that using too slim of a snap-tight for the card can damage its surface. Ideal for holding cards in snap-tights or toploaders, display stands let you show off your cards. They can be placed on a shelf, cabinet, curio or anywhere else you want to be reminded of your collection. Display stands are available in both horizontal and vertical formats to accommodate the orientation of your specific cards. These self-adhesive plastic envelopes are ideal for holding about 20 cards. Some collectors use them as well as a card sleeve and toploader. Graded card bags are also available for slabbed cards. 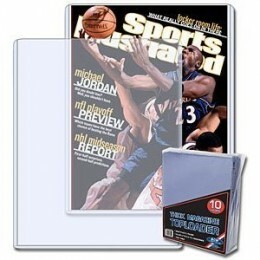 Trading card albums are essentially three-ring binders that hold plastic pages that are specially made to hold sports cards. Albums are a more expensive and time-consuming way of storing sports cards than storage boxes are. However, they offer a great way to display, browse, organize and keep track of your collection. One of the biggest problems with traditional binders is that normal vertical storage and gravity cause the pages to sag and droop. This could potentially bending cards and leave them damaged. Archive-quality albums come with a cardboard sleeve that the album slides into to prevent this issue. Many collectors prefer to store their sets and player collections in albums. To do this, cards must first be put in plastic pages. Pages come with pre-cut holes so they fit into any standard three-ring binder. The most common plastic sheets hold nine cards per page. However, sheets are also available to fit larger cards and smaller tobacco-sized cards as well. 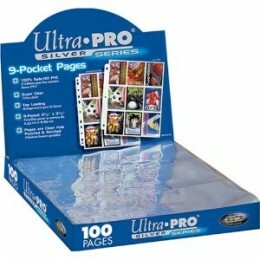 Clear plastic cases provide easy storage for groups of cards. Cases come in many different sizes and can hold anywhere from five to several hundreds trading cards. Plastic boxes are available hinged and unhinged. The most popular boxes for trading card storage are made with corrugated cardboard. These storage boxes are a very efficient and inexpensive way of storing large quantities of sports cards. Storage boxes can hold anywhere from 100 to 5,000 cards. Specialty boxes, similar to shoe boxes, are also available with corrugated dividers. Often used to house higher-end, premium cards, wooden boxes are available with hinged lids and velvet lining. They make for an impressive wow factor when showing your prized possessions to friends and colleagues. They are expensive but of infinitely better quality than standard cardboard boxes. Whatever your prized sports collectible is, there is likely a simple trading card supplies or memorabilia storage solution for proudly displaying it and preserving it for the future. One of my favorite gifts of all time was a box made by my grandfather with my name engraved to house my favorite cards. If you’re going to use plastic to store something, make sure it’s polypropylene (recycle code ‘5’) or Teflon. These materials are inert and don’t outgas. This is why they’re used in the food processing industry, pharmaceuticals and general chemistry labs. You’ll have to consider the trapped moisture issue if the seal is good. I am looking for a hard plastic that will protect old wax boxes. Do you know what company makes them and where on the Internet I could purchase some?